We did (on Saturday, May 28th) make it to Moscow's Red Square (more or less as predicted on May 11th). We found tens of thousands of people jamming the space for some sort of special entertainment day featuring skateboarding contests. Frankly, we couldn't figure out what was going on. In addition, the predominate color was not red, but pink. About every third person was wearing an"Avon Lady" tee-shirt, all sporting that distinctive color! Because of the crowds and the special event, we couldn't get into St. 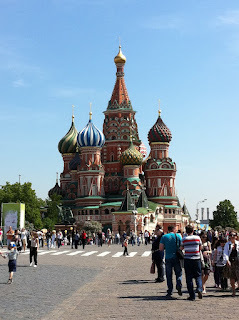 Basil's Cathedral (pictured), or Lenin's tomb, or the Kremlin. 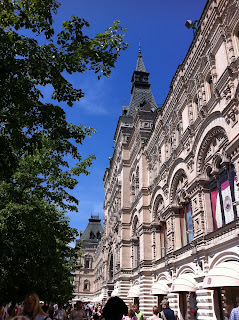 We could, however, get into the GUM department store, which is also on Red Square, nearby those other buildings. GUM is also pictured; you figure out which picture is which. GUM makes that big San Francisco Shopping Center with Nordstrom's, on Market Street, look puny and weak. Looking for evidences of Socialism, we found a few red stars still in evidence, and we discovered a statue of Lenin in a neglected courtyard, about a mile from Red Square. But that didn't rival GUM and the Avon Ladies. Our somewhat reluctant conclusion: in Russia (in Moscow, at least), capitalism has won!